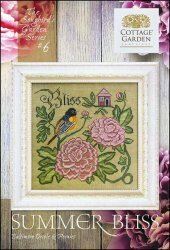 Songbird Garden Series 6: Summer Bliss [J1762] - $9.00 : Yarn Tree, Your wholesale source for cross stitch supplies. Cross stitch pattern from Cottage Garden Samplings. Hello summer! The sweet smell of blooming flowers. The sound of birds singing. The bright summer sun. Combine all of these things & you have "Summer Bliss." Stitch count 159w x 159h. Raw Belfast Linen Short Cut 13"x55"